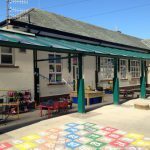 A 36 metre long mono-pitched Twinfix canopy installed at Lancaster Road Primary School in Morecambe has added considerably to the education of their 90 reception children. 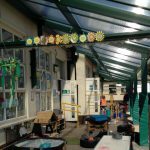 The new canopy is adjacent to the classrooms, thus ensuring easy free-flow of indoor/outdoor provision. 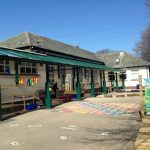 Once the canopy was installed the school applied for and gained a Lottery grant that enabled Susie Hill, the Foundation Stage Manager, to equip the area under and around the canopy. 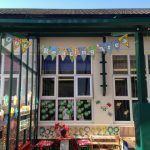 She organised the 136 sq metre covered space into dedicated zones for such topics as phonics, reading and small world, with complementary playground areas alongside each section. 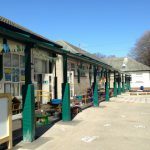 There is also a covered wooden sandpit, a big tank of tadpoles that the children can watch growing into frogs, boot stands to hold outdoor shoes, and lots of other interesting, colourful items to help stimulate small children and help in their learning, language and communication skills. Working for Lancashire County Council and Main Contractor Conlon Construction, who were undertaking other work on the school site, Twinfix provided Headteacher Paul Gabriel with a computer generated visual of how the finished canopy might look. This graphic enabled everyone to see the full extent of the proposed canopy and gave the staff an ideal opportunity to put forward their own ideas. They decided to change the original design slightly and the finished canopy has a straight roof line right along its front length. 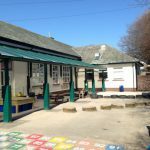 Twinfix manufactured the canopy with an aluminium frame powder coated green and consists of rear-mounted bracket supports fixed to the building with 12 front posts that are fitted with padded protectors for safety. 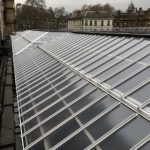 The roof comprises our Multi-Link-Panels NF glazed with tough 25mm clear multiwall polycarbonate. These panels are Non-Fragile to the ACR[M]001:2014 drop test. Twinfix aluminium rainwater goods were also installed. 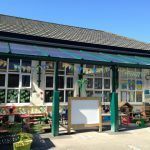 One end of the canopy that is now used as a Reading Area is glazed with a vertical 6mm solid clear polycarbonate screen that helps provide protection from the weather and against the harmful effects of UV in sunlight. 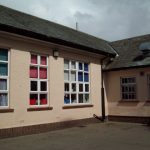 Lancaster Road Primary School was first established in 1932 and many of its classrooms then opened directly to the outside. This was state of the art design at the time that enabled children to have plenty of fresh air which was thought to be beneficial in avoiding illness. 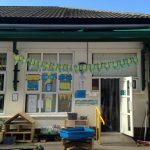 Nowadays children are still encouraged to enjoy the benefits of being outside and the reception classes are certainly making the most of their opportunities for outdoor learning through play. One of their more famous former pupils was comedian Eric Morecambe whose photo is proudly displayed near to the school trophy cabinet. 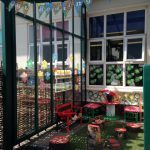 The new reception playground includes a small stage for the children to use – I suspect that Eric would approve! 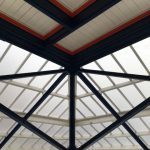 For over twenty years we have been supplying our Multi-Link-Panel roof glazing products into railway stations across the UK. These products are incredibly quick to install so are a popular choice for rail installation that usually relies on limited possession times. 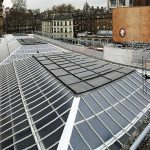 Recently we refurbished the roof of the Porte Cochere at Victoria Station in London with our Non-Fragile Multi-Link-Panel, glazed with Twinfix Georgian wired polycarbonate. 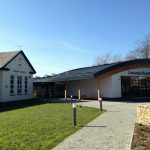 The project was completed on time and looks fantastic. We are now pleased to announce that we have recently attained the RISQS qualification which will allow us to become more involved with rail work in the future. We are very proud of this achievement and the opportunities this will open up for the company.